Welcome back from the long holiday weekend. I’ve been out of town for a week and I’m eager to get back to work! Light rail parking fail: Sightline’s Michael Andersen dissects the absurdity of TriMet’s plans to spend $168 million on free auto parking along the SW Corridor light rail line — twice as much as it will spend on affordable housing. Better streets: From slow zones to congestion pricing, a New York-based architect and urban designer shares lessons on better streets gleaned from visits to Amsterdam, Copenhagen, London and Stockhom. Words matter: On the same week as World Day of Remembrance for Road Traffic Victims, the Houston Chronicle ran an excellent summary of why we must change how we talk about traffic crashes. 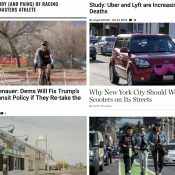 On the Media on the streets: I have yet to listen to the whole episode, but with guests like Streetsblog reporter Angie Schmitt, “Fighting Traffic” author Peter Norton and Citylab reporter Emily Badger, this week’s On the Media pod is sure to be a must-listen. Cycling starlings: Scientific observations of Tour de France pelotons reveals insights about the collective behavior honed by professional cyclists that allows them to ride so closely to each other without crashing. No freeway, no problem: Yet another example of a major freeway closure (this time in San Francisco) that didn’t lead to the expected consequence of more auto traffic. Gone in 49 minutes: A German was caught speeding on the way home from his successful driving test. He was caught by police, banned from driving for a month and must undergo “retraining”. Speed crackdown: Faced with a deluge of complaints, the mayor of a small Italian town installed traffic cameras and issued 58,000 speeding tickets in just two weeks. 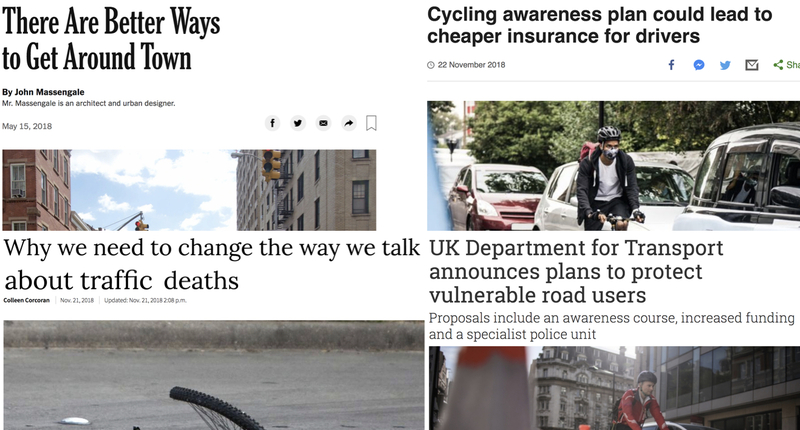 UK steps up for cycling: The UK Department of Transport says they’ll add police staff to process video footage, increase driver education, step up bike lane enforcement, and more as part of dozens of measures aimed at making cycling safer. Climate change urgency: A group calling themselves the “Extinction Rebellion” is shutting down streets in London to bring attention to the imminent threat of climate change. Regarding the Central Freeway closure in San Francisco, can we please just close I-5 between the Markham and Fremont Bridges already? Hasn’t that closure and the 90s teardown of the Embarcadero Freeway in San Francisco (as well as “carmageddon” closure of the 405 in L.A.) proof enough that Freeways trough cities are the actual cause of traffic jams? “Where’d everyone go?” CalTrans wonders. People will deal with it without the freeways. Freeways are handy between cities, but they just shouldn’t go through cities anymore. If we got rid of I-5 on the east bank and just called I-405 the new I-5, we’d have at least 4 fewer interchanges (which are always a multiplier for congestion). I-84 would just dump into the inner central east side — and for those wanting to go north or south on I-5, they’d detour onto I-205. It’s such a travesty that such prime river-front property is dedicated to the high-polluting, high-speed, low-livability freeway space. In the 80s or 90s, as I recall there was a big City Council debate and decision about the East Bank freeway. I believe the issue was whether to keep it or remove it. One study back then recommended removing it for reasons much like yours–it’s prime real estate, its presence compromises development, and it’s not needed. A key point was that it functions as a street, not a freeway, because much of the traffic is people getting on and then off after a few blocks–a type of traffic more safely and efficiently handled by streets. So dump more traffic load and pollution on other parts of the city so you can enjoy your riverfront? Read again. Your doomsday scenario does not not happen when freeways are removed. How about just the through lanes so that access to and from the I-84 is maintained and all N-S traffic uses the 405? Here! Here! Tear down the Marquam Bridge and Eastbank Freeway, and return this valuable riverside property to productive use. Almost all traffic injuries are indeed "accidents". Accident means "unintentional". It does not mean "unpreventable". The second statement may well be completely true, but it does not follow from the first. If you're going to police other people's language, at least get your facts right! Sure, if you want to cherry pick the meaning behind the article. All traffic accidents are crashes. Not all crashes are accidents. How about that? That’s the whole point. “Accident” while accurate much of the time (but not always), implies no fault or unavoidable to too many people. “Crash” or “collision” is at least neutral enough to allow for the followup questions as stated in the article. I “cherry picked” this one because it comes up in this forum time and time again. There may well be examples of crashes that aren’t accidents, and I would not complain if someone pointed that out in those rare instances where the word was misapplied. Further, I do not object to your use of “crash”, and use it often myself. I object only to others objecting to the correct use of the word “accident”. Accident: an event that happens by chance or that is without apparent or deliberate cause. This issue seems to hinge on whether someone carelessly driving down the street at 150% of the speed limit while only glancing up from his phone occasionally who then crashes into someone has been involved in an accident. He certainly didn’t plan to hit whatever hit struck, but it was certainly predictable that he would crash into something/someone and the cause is apparent. I find it to be the same as strapping a loaded shotgun with a defective trigger to one’s handlebars and then riding along on our bumpy roads. When someone is shot by that thing, it wasn’t an accident, it was negligence. Ditto for the careless drivers. If people insist on recklessly handling tools that can kill innocent people, they should be held responsible whether those tools are firearms, cars, explosives or biohazards. In all of those cases, there are licensing and/or training standards in order to obtain the privilege of operating/handling those tools. It is a willful act to disregard that training, not an accident. IMO, crashes are commonplace and are invariably caused by motorists disregarding their training and the law, while accidents are quite rare (axle breaking, tire inexplicably failing under normal operating conditions, that sort of thing). If accident meant without cause, I would agree with you. Point being, “accident” applies having already reached a conclusion about the mental states of the parties involved. “Crash” does not. So it’s inaccurate to default to calling them “accidents”. “Accident” also implies a sense of inevitability that “crash” does not. If as you say you do not object to “crash”, then why must you object to people saying they prefer it? I don’t at all object to preferring the term. I object to criticizing people who don’t. Noted. Do you really need to mention your discomfort with this at every opportunity? I suspect you are familiar with the cultural implications that drive the strong objection that you object to. Here in California the first rains of the season hit the streets, and the news channels faithfully reported that “the rain caused many cars to crash” (including Steph Curry’s!). Not too long ago there was a public hearing on a bike lane proposal in downtown San Jose, and the TV reporter was standing in the street pointing to all the parking the new configuration would remove, and pleading with people to show up to the hearing to express their opposition. Thank heavens for unbiased journalism! 1. an unfortunate incident that happens unexpectedly and unintentionally, typically resulting in damage or injury. It’s argued that if you’re breaking the law when you crash then it was not unexpected. And with speeding then you’re doing it intentionally, which one would expect will cause a crash. If you’re not paying enough attention to ensure the road is clear in front of you then it’s expected that you’ll crash. Most crashes have an apparent cause. What people are doing is using the term “accident” to mean that there was nothing they could do about it and thus they shouldn’t be punished. It doesn’t matter if you intended to crash or not. We shouldn’t be using this term in a way that dissolves guilt. If people expected to crash when they sped, they wouldn’t do it. They are not the robots you suggest. It’s not that anyone average expects to crash while driving, it’s that speed kills. An “accident” at low speed does not. At high speed, an “accident” is all the more likely and will lead to greater injury and more likely death. You can play the pedant over “accident” all you want, but deaths are fully preventable with some discipline and the continued use of “accident” in crash reports obfuscates that. I do not see why you continue to rail agains this. Stated and asked another way: Why are you so hung up on the pedantic meaning of accident rather than its nuanced meaning. Words matter, including their implied meaning. Crash and collision have none of the wiggle room that accident has — do you acknowledge that? I guess I don’t see “accident” as obfuscating that most of these events have a readily discernible cause. In fact, I think that while crash is descriptive of the outcome, accident is descriptive of the cause. People make misjudgements and take unnecessary risks all the time with no negative outcome; on a relatively rare occasion, there is an unintended (bad) result. I think accident captures that nuance quite well. It’s not like dropping a rock on your foot that’s going to hurt every time. For example, there is a curve near my cousin’s old house where he routinely drove too fast. He probably made that turn over 5,000 times before he crashed. It was entirely his fault, and while it was clearly the result of driving too fast, there was also an element of randomness that caused this crash after 5,000 successful navigations — perhaps a bit of oil or water or ice on the road at just the wrong place, perhaps a tiny bit less tread on his tire than in the past. So maybe driving too fast wasn’t the cause; maybe the slippery patch was. The result was entirely unintended, and, on that particular evening, unforeseeable (though in a sense entirely predictable if you took in the entire arc of his driving career). Some people seem to have this weird idea that if you go too fast (or even less sensically violate a law) you should expect to crash. Well, no, you shouldn’t, because most of the time you don’t. Most of the time things work out just fine. You’re just making it more likely that some unexpected and unusual event (of which life is full) will lead to a bad outcome. Oh, and in case anyone is wondering, besides wrecking a rather expensive car, no one was (seriously) injured in the crash. You misunderstand. I’m asking that others not play the pedant. I’ll refrain from talking about it further if others do as well. And I promise never to chide you about using the word “crash” whenever you feel it appropriate. For anyone interested in this subject I recommend this highly. A teaser: Freud and the non-accidental accident. “accidentally on purpose”…is what we said at 17. I don’t think there’s a misunderstanding here. Words are tools for culture shift as JL implies. There is a reason companies invest in “Mission Statements” and “Vision.” (My company’s latest iteration is “behaviors”, and you can probably guess who I work for if I tell you our well-publicized downfall is often attributed to a culture of “success theater”). It’s also that speeding in a car is culturally acceptable. We all know 5-10 MPH over isn’t breaking the law, it’s bending the rules – not like those cyclists who “blow” stop signs. An accident is when a toddler just learning to control his/her body spills a cup of milk. It is not an accident when a person gets drunk, decides to drive, speeds down the highway, blows through a red light and mows down a pedestrian. The killing of the pedestrian was not intentional, but the drinking, driving, speeding, and blowing through the light were deliberate choices (not unintentional actions) by the motorist leading to an entirely predictable outcome. I actually agree with you in the scenario you described, where conduct is highly egregious. If all accidents were because of drunk driving, your example would be valid. But it’s for a specific subset of crashes. I’d be okay with the blanket use of “accident”, as long as the police and news sources place “negligent” in front of it. If everyone were always driving safely, “accidents” would never happen. Of course they would still happen, though they would be less common. A reassuring notion, but not accurate, unless you are being tautological and defining safety to be the same thing as accident-free. I disagree with that. You can be driving safely and have something happen that causes an accident…like someone dropping a large rock from an overpass onto your car, which causes you to lose control and crash into another car. That would be negligence on the part of the rock-dropper. Anything after that is just incidental. The “words matter” folks almost invariably fail at their own game and then accuse you of not getting what they are saying – based upon the words they used. Another zero-calorie categorical jeer from MoTRG. Could you trouble yourself to be more substantive in your criticisms here? I think it is fairly obvious, actually. If you can’t grasp it I have no obligation to explain it. Straight out of wspob’s playbook. I never hear of jet accidents, or surgery accidents. What do you call the doc who opens the wrong side of your chest looking for the spleen? Not an accident. If a licensed motorist decides to speed, or not pay attention, drive inebriated, or drive with a dirty windshield, there is nothing accidental about those decisions. Those decisions are not called “accidents”. It’s called a medical error. Errors are not intentional. Ah, but errors have fault (see baseball). So should accident, but it rarely gets applied or assumed; what parent hasn’t said to children, “it’s okay, it was just an accident” (and what child hasn’t used it as a cop out) — thus people’s objection to the use of accident as the descriptor. It’s not that people are objecting to the literal meaning of “accident” but rather its manner of application and typical interpretation. It’s a more weighted word in the American lexicon than the more pragmatic “crash” or “collision” descriptors. Nuance people! But along your line of logic…let’s say a cyclist is riding at night with no lights and gets hit by a care. Is the cyclist at fault? I mean, them not being lit up leads to a predictable outcome, no? Agreed, such a person would have at least some culpability by way of violating Oregon law. As would a driver with lights off, as can be seen rather frequently in the early part of darkness… or with headlights that don’t meet the distance standard because they’re glazed over ( https://www.oregonlaws.org/ors/816.050 )… or overdriving the effective distance of their headlights in poor visibility, thus violating Oregon’s basic speed rule ( https://www.oregonlaws.org/ors/811.100 )…. Wow, a whataboutism that doesn’t even relate, at all. The proper question would be would I call that an accident? No, I still wouldn’t in a police report or report piece. I’d call it a collision or crash. Your point now is what? Michael Anderson’s light rail parking failure article is great. I agree, it’s well-written. Obviously the parking structures are not needed, so why is TriMet building them? The article never actually answers that question; presumably TriMet didn’t respond in a timely manner, and it’s even possible that some staff there don’t know. For finding the answer, I’d recommend looking at the budget in finite detail. In many states, state highway funding can only be used to “add capacity” to the roadway or transit system. If TriMet is using ODOT funds (and they probably are using some as “match” for the federal grants), then the deck could be a substitute for “added capacity” of extra road lanes. Dumb, but maybe necessary for getting the matching funds? However, even if TriMet wanted to use their federal transit funds for more housing, they can’t – it’s illegal to do so, per FTA & ODOT regulations. So I find Michael’s premise of housing versus parking decks a bit nonsensical; the parking decks versus more bike facilities is a little better, but I’m not sure the FTA would go for it; parking decks versus more rail is a lot better argument, IMO. If they’re not needed, then why are they full? Why is it that at Gateway the street parking is also full and Fred Meyer has to patrol their lot to keep it from also turning into light rail parking? It’s taking cars off the road. Don’t build it and all those people drive into downtown for work instead of parking and riding the last part of the way. All those emissions aren’t being spewed into the environment. You will never get someone in Vancouver to bike into work in Downtown Portland, but you can get them to transfer onto mass transit. If someone from Wilsonville drives up to the nearest light rail and finishes their trip that way, it’s a win in my book. It’s not a win if we spend $50k-$70k for that parking spot to be used for just 9 hours a day on weekdays. It just subsidizes sprawl. And per the article, when you look at the park and rides as a whole, they are not full. We have a few close in P&Rs that fill up quickly, and probably need to charge demand-based parking fees. If P&Rs can be self-funded through parking fees, go ahead and build them. If we’re going to require that the parking for mass transit be self funding, then let’s also require that Max do the same. Hey, and while we’re at it, we can do that with street parking, highways, residential streets, airports, etc. lots downtown costs around $15 for the day. A park and ride would have to be a lot less than that to make it worth while of riding transit and going through the transfer process. Say you have to pay $15 for the park and ride and then $5 for your all day Trimet pass, that’s $20. I imagine most people would just drive in. Check this example, and I imagine more and more people are doing it: park on the east side – for free – in the neighborhood blocks and take the bus into downtown. Guy I know, does it everyday from Estacada. I agree. It would also help if we had tolling points on all of the freeways leading into Portland. $5 to enter the city by car, and $5 a day for the park and ride spot outside of the city. Your fondness for this zero-sum logic is not helpful when it comes to driving, as we know from countless examples. #induced demand for starters. Throwing the term “induced demand” out there like it’s the Gospel of All Things Bad and that it automatically wins an debate is zero-sum logic. I think it is incorrect to say adding additional parking is creating “induced demand”. Can you prove that the parking is not being used by car-poolers, for instance? Would those people be driving even further were there not additional parking spots at a transit station? Some additional demand, if it reduces far great additional demand is a win (especially in a region with a growing population). Taking the stance that any and all additional demand on roadways is bad is a fundamentalist view to take and fundamentalists are easily proven wrong. If the lots are full, then there is clearly demand for the transit. If you can’t provide a way for people to use the transit, they might just end up driving downtown. The one thing that is likely is that adding parking spaces will induce demand for transit. last time I checked, that’s a good thing. First off, thank you for spending so many words. I do appreciate it. Something to sink my teeth into. My understanding of what zero sum means is that both parties lose, or we all lose either way. Induced demand isn’t about losing either way, it suggests that if we are wise to this internal mechanism we can avoid it (win). This is what a road diet or taking out Harbor Drive is about. Everyone wins, and lane miles, driving, asthma are all reduced. Nothing zero sum about it. And I didn’t mean to suggest anything about automatically winning a debate; just that we would do well to take something as basic and counterintuitive and evident as induced demand into account whenever we talk about such matters. You may think that, but I think that Donald Shoup’s book is a many hundred page treatise on how this is exactly what happens. We would do well to consult the man himself rather than making do with my poor interpretations of his work. I’ll get back to you on this when I’ve had a chance to do just that. Ivan Illich was a wise fellow, and he identified numerous such relationships—what you are calling fundamentalist views—and was very eloquent in admonishing us to take heed. More transport; greater speed; everyone loses. Again I refer you to Illich himself. I challenge to you ‘easily prove him wrong.’ Many have tried. Right. DEMAND. And it was because of DEMAND that folks were stacked 8 miles long on I-5 southbound last Friday so they could buy another bauble, and the vast parking lot at those wretched outlet malls were already FULL. Hahaha. We just spent $70 million of our tax payer dollars three years ago to ‘fix’ this. Some demand just isn’t worth chasing, my friend. It quickly becomes a fool’s errand to try to do this. As we can see in the above example. Illich recognized these limits and we would do well to also. Oh. I see. The ever-ready threat of ‘they might drive.’ See, this is an example of a lose-lose proposition I have been talking about: Build more parking lots… or everyone will drive even more. We need to think our way out of these absurd, defeatist, dead-ends where we predictably make the problem worse instead of ever getting ahead of it, transcending it, making it disappear. I feel like a lot of commenters on Bikeportland are wishful thinking about the behaviors of the general public. If we tweak this or that, people will drive less. Make this or that safer and people will ride more. Make it more expensive to do this or that and people will take transit. I’m a skeptic. When we’re taking about the general public, whom 80 percent fail to engage in just 2.5 hours of moderate exercise a week — we think that all of a sudden these same people are going to hop on their bicycles at first notice — our ideas of driving aren’t grounded in reality. Americans love their cars and I don’t think Portlanders and the surrounding communities are any different. I believe most people, most of the time, will pick driving regardless of their transportation options. There’s ways to make driving cost prohibitive, but the politicians will be voted out of office long before these policies are enacted. Auto culture has such a strong grip on American society that I don’t know if it will ever get better. Yes, we see the park and rides full and that suggest people are taking transit, but they’re still driving x amount of miles to get there everyday. 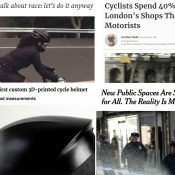 Us, here on this journalism site, some who ride 20 miles one way, others that hop on their bikes to ride to the bust stop regardless of the weather, the parents who cart their children to school everyday, we are unique to the general public, especially when compared to the American People as a whole. It is important, I think, to differentiate between preferences and constraints. I agree with you that in terms of preferences it is unlikely that we’ll make much headway, but constraints are going to solve this. Constraints we will be powerless to do much about. But having said that, price elasticity of driving we do know something about. If we were to hike the price of gasoline in a steady predictable manner, this will have salutary effects (including discouraging discretionary driving and making it possible to buy/build/maintain high quality alternatives to driving with the massive funds so raised) that are well understood. Others are and have been doing this. We could do it more. Perhaps also true, but I think the primary driver of driving isn’t a love of cars but habit, infrastructure that privileges and subsidizes driving, etc. You’re r operating under the assumption that politicians are going to act counter to their constituents in terms of gasoline taxes. I don’t think so. The debate will be framed in a negative light by opponents: “Governor Brown is in favor of gasoline tax hikes so that you are forced to drive less!” People see right through the propeganda. You talk a lot about “constraints” but there are no hard constraints that will force the issue, like running out of oil, anywhere on the horizon. Sure, climate change, but that’s really a set of tradeoffs that different people will view differently. The fundamental problems with this sort of logic is that building parking lots continues to shore up automobility. The ancillary actions that may be incentivized through these lots pale in comparison to the very real costs extending automobility’s grip on our planet represents. Cheap fossil fuels, personal automobiles, paving over our planet with parking lots, asthma rates in children along our transport corridors, oil wars, global shipping of baubles (and I haven’t even mentioned climate change) are all linked and not long for this world. 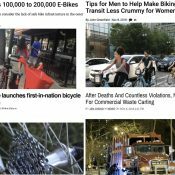 We can think our way out of this, but we have to be brave and bold and stop pussyfooting around, stop trying to rationalize cars and parking lots because… transit. How do get beyond the pussyfootin’ around, 9watts? How do we force the massive shift you are advocating for? Listening to scholars—people who spend their lives studying the important questions of our time—would be high on my list. Remaining skeptical of everything, all claims by elected officials and bureaucrats; challenging the often shallow analyses, shallow thinking, reflexive assertions by those around us. Holding ourselves and those whose salaries our taxes pay to higher standards, demanding answers from them, accountability, bold thinking, eyes wide open about how we are going to jointly steer us all through these tough waters. Almost nothing actually works well in this country: transport, health, energy, education, food, equality, happiness, civility, trust, until you get down to the block level, and even then it doesn’t always work. Another approach, which I’ve long advocated here, would be to use our public dollars to highlight what people who don’t have or use cars (substantial shares of some of our census tracts in Multnomah county) do, how they live, take care of business, how they feel about carfree life, rather than continuing to subsidize rich people who buy electric cars, from which we learn nothing. 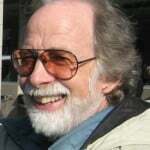 Let’s acknowledge those who are already doing what deep down we already know we all eventually should be doing, spread those lessons around, rather than always and predictably subsidizing the capitalist ‘answers,’ which aren’t really answers even as they reassure us that corportations will fix this for us. The odd spirit of individualism. Somewhere along the way, support of transit with the valid goal of reducing car trips (and the ultimate goal of lesser environmental impacts) turned for many people into the idea that using transit is the goal itself. With things like the expensive parking garages (or the ferry to Vancouver) the question becomes, are we reducing car trips, or are we making it easier for people to live far from work, often in suburbia, with the ultimate impact of achieving the opposite of what the goal was. Thanks for the thoughtful reply. I’m going to ask the same question, though. How do we actually achieve what you are describing? I’m not being obtuse, I’m curious as to how we actually do those things. We don’t seem to be able to make much ground within one city (or a neighborhood) on a lot of the topics you describe. How do we build enough momentum among the larger society to affect needed change? Is it possible? I thought the original idea behind transit was to move a work force who doesn’t have access to another form of transportation around a densely populated city. Fair questions all. I don’t have a quick answer, or a strategy ready at hand that would deliver a quick result. As with most things that are worthwhile or important, it is going to take time and hard work. Ralph Nader’s conception of what it means for us all to act like citizens may be the best recipe I can think of. If you want me to say how we are going to get folks to take his advice, I don’t know. People, by and large, act so disempowered, don’t realize what they could accomplish if they participated fully. Underlying your statement is the assumption that if people acted with their full capability, they would do what you want them to do. It may be that many who are passive would fight for the status quo if they became active. I am not sure why you think that. More participation is always better than less participation. Our society isn’t screwed up because the wrong people are participating, but because money and corporations run everything and regular people don’t challenge their disproportionate influence. When polled, most people in the US want what the Left in most other countries delivers: quality free healthcare, decent public transportation, free higher education, paid family leave, a justice system that treats everyone with dignity. So if more people participated I think the statistical probability of some of those things coming to pass are pretty good. Since when does the status quo need defending? Since we are in the hypothetical realm I suppose you may be right, but I have a hard time imagining it. The status quo isn’t currently delivering anything useful for the majority here in the US; the only winners are the super rich. You imagine that only if the people would rise up and defy the corporations then we would get a leftist Nirvana. And yet our president was not the establishment’s choice. And while the Democrats won in the house earlier this month, it wasn’t exactly a rout, and they lost ground in the Senate. I am not sure the evidence supports your opinion. You do have a penchant for making my honest suggestions sound ridiculous. Wait, so there are only two flavors? Are you forgetting the trajectory of the other populist guy, the one who isn’t a racist demagogue? I wasn’t talking about party politics, mind you; you have brought this into the conversation. I am quite sure that the evidence you like to muster here in these comments does not support your caricature of my opinion. But I’m not particularly troubled by that; I’m not even sure we are talking about the same thing. “The other guy” who wasn’t even in the election? Or do you mean Stein or Johnson? I believe that a lot of people underestimate the power of familiarity and comfort. Even though we have a continually increasing, unequal distribution of wealth, the vast majority of Americans have a pretty comfortable way of life. And they do not want that familiar apple cart upset. For a paradigm shift to occur, we will need a great leader in addition to the tireless work of the people like you mentioned. Making those “impossible” decisions will have to come from a place of convincing charisma, since relying on science and data doesn’t seem to work. In my case I don’t think my problem is underestimating folks’ attachment to their comforts and habits, but overestimating their propensity to think beyond themselves. 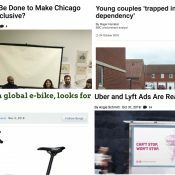 We can drift toward being consumers of conveniences, or we can challenge assumptions and hold the powerful to account – as citizens. This is where I think Hello, Kitty and I get into trouble. Hello, Kitty is very attuned to the pragmatic, the status quo, the stuckness of everything. I’m more focused on what could be, and what we individually and collectively could do to fix things all around us, make noise, knock heads, refuse to take no for an answer. I found that to be one of Michael’s best pieces, and that’s saying a lot. I only wish he would have been allowed more space to expand on it, but he certainly covered the topic and its implications fabulously. I liked it as well. His question about building parking garages and CO2 at the dawn of the era of autonomous cars got me asking the same about the entire endeavor. Autonomous vehicles won’t change the geometry problem of large vehicles in a dense urban environment, on roadways that can’t be widened due to adjacent development. Also, fixed guide way transit is much easier to automate than cars. Automated trains seem very obvious, but offer few benefits to riders that staffed trains don’t. Vancouver BC’s Skytrain is automated, has been for decades. UP and BNSF use robot engines in their yards. Morgantown WV has an automated people mover since the 70s. Robot transit is hardly new, but robot cars in traffic are. Lower operating costs, which allows the transit agency to provide more service with the same budget. The most expensive part of your bus ride is the driver. How will a scheduled, fixed route service compete with the on-demand, point-to-point services that are likely to spring up with automated vehicles? It will always be cheaper than on-demand services with just one rider. Add multiple riders, and it is no longer point to point, unless they live and work at the same location. With commuters, for example, there are often several people going from nearby one another to nearby one another, so something approximating a point-to-point small bus seems entirely feasible. Kind of an automated carpool, but on-demand. And I do not assume that automated vehicles will only carry one passenger each. I assume most will carry zero passengers, especially on their way to pick up passengers. But many will be used for freight movement, including package delivery, groceries, moving Fido to his playdate, etc. Why do we need truck drivers, UPS deliverers, and postal employees when all that can (and will) be automated? ADT (Average Daily Traffic) that planners and engineers use to plan and design roadways will now become emphatically more towards the flow of vehicles and be even more disassociated about the flow of people. Why will we need truck drivers et al? We probably won’t. Why do you think the advent of automated driving will suddenly remove American’s disgust at the idea of sharing an enclosed space with the unwashed masses? I expect there will be different classes of service at different price points that will act as a filter for those so-concerned. And of course some will continue to travel alone. I’ve been thinking about this more… what do you think the CO2 payback period will be for the Orange line? I think there is a reasonable chance the answer is closer to “never” than “now”. The only issue I have with it is that TriMet only does transport, it doesn’t do housing– that’s Metro’s and the various cities’ jobs. Why would TriMet spend money on affordable housing? It does buses and trains, not houses. A better question would be why Metro isn’t doing more with the various cities to ensure quality affordable housing is being built along the SW Corridor. LOVE that Italian mayor!! Forza!! Ignorance is not a suitable defense for predictable outcomes. I’m not offering it as a defense, but rather an explanation. If you expected to crash, why would you even get in your car? Why would a woman even go out at night? That is, you would NOT expect to crash even when speeding, etc., because delusion. Not delusion, experience; you expect not to crash because you’ve driven above the speed limit thousands of times before without crashing. Why would this time be different? I knew a few people while I was in the military who had driven drunk nearly every weekend for years without a ticket or collision. When/if they ever hit someone, would we not consider that to be something they should have predicted (and therefore changed their behavior to mitigate), even though their prior experience seems to show that it wasn’t expected? Oh, and they also continued to drive drunk because they believed their driving skills and ability to handle their alcohol made it not dangerous. They were definitely delusional. Of course they should have changed their behavior. Well, yeah… I’d guess most people would agree that they were behaving dangerously and a collision would be expected at some point. But that’s the point of the delusion argument. They felt that driving intoxicated wasn’t dangerous *for them*, and they could rationalize/justify it from their experience. It’s likely not an either/or argument when talking about whether it’s delusion or experience that makes someone not expect to crash while speeding, but that their experience (of not crashing while speeding) reinforces their delusion (that their driving abilities are superior to others so speed laws don’t apply to them equally). I know it’s only a matter of time before I get into a bad crash on my bike. And yet I still ride daily. I must be delusional too. If you really do think it’s only a matter of time before you get into a bad crash on your bike, then no — you are not delusional in the same way as in Ryan’s example, where the folks believed they would NOT crash. But you must think you have dangerous behaviors while on your bike. Why not improve your odds by phasing them out and phasing in safer ones? I definitely do have dangerous behaviors: I ride after dark, in the rain, alongside trolley rails, and amongst slippery leaves and cars with drivers that may not see me. But you’re right — I may not be delusional; I’m probably just crazy. Those aren’t dangerous behaviors. They are potentially dangerous conditions. They can be mitigated with preparation and technique and practice (safer behaviors). For rain, rails, and leaves, ask any friends who mountain bike or ride cyclocross to teach you how they turn and brake on slippery stuff, and how they hop over things the size of rails and bigger. (Yep, go-fast skills can also help with safety.) For darkness, it’s more lights and reflectors — especially on the parts of you that move the most (pedals, shoes, lower legs, wheels). For drivers during darkness, just don’t take on as much exposure on your route and in your choice of routes as you might in daylight. Do a Copenhagen left instead of sitting in a left-turn lane, for instance. None of that _eliminates_ risk, of course. But it can help make “accidents” less likely. The section of San Francisco’s Central Freeway that article refers to was closed in 1996. Why did it show up here as news now? That’s a really great question. The first time I rode it there were stations isolated from everything and long sections with no housing in sight. Curious place to put mass transit. I think there’s an implicit assumption that some day Clackamas County will roll over and the line will be extended. Things change fast these days, I need to do another transit outing and see if it looks any different. Maybe Milwaukee has popped up 5 stories in the last 12 months.